Dave Grohl is to present and produce his own TV series for US cable channel HBO. Expanding upon the ideas explored in Grohl’s acclaimed Sound City documentary, the series will see the Foo Fighters’ frontman visit, and record music at, some of the world’s most iconic recording studios. 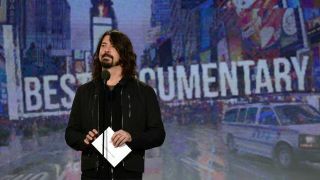 Grohl will also conduct interviews for the series, speaking with some of the artists who have recorded at each facility. Studios featured in the series will include Nirvana/Page & Plant producer Steve Albini’s Electrical Audio studio in Chicago, Don Zientara’s Inner Ear studios in Washington DC – where Fugazi, Henry Rollins’ first band S.O.A. and Grohl’s pre-Nirvana punk rock band Scream recorded - and Rancho De La Luna studios in California, a site at which Queens Of The Stone Age, Arctic Monkeys and Mark Lanegan, among others, have laid songs to tape. The singer has also visited studios in New York, Seattle and Nashville. Musicians interviewed for the series include Kiss frontman Paul Stanley, Heart’s Nancy Wilson, Joe Walsh from The Eagles and Dischord Records head honcho Ian MacKaye. It is expected that the as-yet-untitled series will air as part of HBO’s winter schedule.